The reported addition of the Japan-based Nichia as an exclusive supplier to Apple has seemingly revealed how the LCD model in this fall's iPhone refresh will have a similar edge-to-edge display as the two OLED models, also expected to launch this year. Nichia is a producer of LED chips used for backlighting in LCD panels, and will be supplying the component to Apple for the 2018 iPhone, industry sources advised to DigiTimes. The specific component ordered by Apple is a 0.3t LED chip that may solve the production problem of creating an LCD-based edge-to-edge display. Smartphones with LCD screens typically use 0.4t LED chips for the backlighting, which results in a bottom bezel measuring between 4 and 4.5 millimeters in size. Using 0.3t LED chips, this space can be reduced down to between 2 and 2.5 millimeters, a much more acceptable size for the intended application in upcoming iPhones. OLED, like the version used in the iPhone X, does not require a backlight as the individual pixels can produce their own light. This also allows for OLED to be produced for flexible or folding displays, making it extremely useful for producing edge-to-edge screens. The sources advised that, due to the increased difficulty in packaging the smaller chips, Nichia began trial production in the first half of 2018, supplying the component to Chinese and Japanese smartphone producers for use in premium devices. Trial production for Apple's new wave of iPhones is expected to start this month, with small-volume production taking place in August, then volume manufacturing in September. Taking into account the timing, the report sources advised Nichia's production capacity for the chips will be almost saturated for the second half of 2018, manufacturing just for the iPhone. 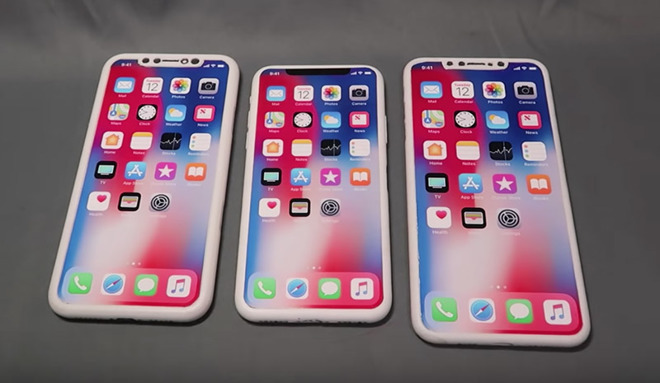 It is currently anticipated Apple has three iPhones for launch this fall, with the 6.1-inch LCD model expected to be the lower-cost version alongside a refreshed and higher-specification iPhone X and a 6.5-inch OLED "iPhone X Plus." A recent set of benchmarks suggests the A12 processor that will be introduced in the new models will have six cores and a base clock speed of 2.49GHz, and may be accompanied by up to 4 gigabytes of RAM.